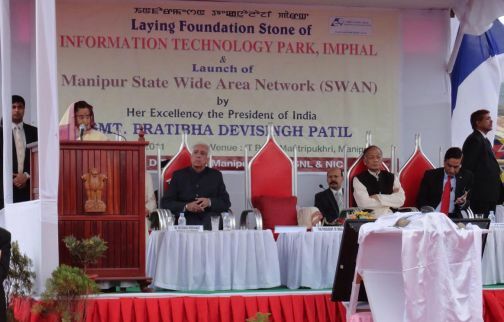 Imphal, Apr 7 : Manipur is all set to get its first Information Technology (IT) Park that will provide a thrust to IT industry in the region. Mantriphukri at Imphal is an upcoming IT hub. Hundreds of IT professionals from all across the country will be working here once it is operational. The 27-acre IT Park is part of the Special Economic Zone (SEZ) in Manipur that is being constructed at a cost of Rs 500 crores. "There are so many boys and girls who are educated in the Information Technology. They got B-tech, M-tech and other qualifications. This will generate employment, a source of livelihood to and also increase the economy of the state," said D S Poonia, Chief Secretary, Manipur. The SEZ will have a hotel, health and shopping centre, guesthouses as well as serviced apartments so that the employees can work and stay on the premises. The IT industry is slowly picking up in the state with small companies coming up but there is a serious need of investment from multinational companies to create better opportunities. As of today, thousands of Manipuri IT professionals are based in different parts of the country, and if the IT park can attract big companies and generate similar job opportunities then many Manipuri IT professionals would prefer to return home. "A lot of development has taken place in the last year. Earlier there were few IT professionals, but now it has gone up and there is a lot of change taking place. The government is taking a lot of initiative in the field of IT Industry. So it's a good opportunity," said H Kunjeshwor Sharma, Managing Partner, Capital Information Technology, Imphal. The state government has plans to set up BPO's in the park with the help of private companies. Recently a government team visited Bangalore and studied the IT industry with an aim to implement what it found useful. "IT Industry can really progress in Manipur, in the long term. We do not need transportation because in IT we send products through connectivity. Government should take up strong initiative because there are many youth who are unemployed and the IT industry can create generate employment," said Naresh, Manager, Extreme Wave. Prolonged insurgent activities in Manipur have prevented the socio economic and industrial development of the state that has a large human resource pool, which if used optimally can provide a major boost to the economy of the state.